Just made some new handouts for our instructors in training about skills and wanted to pass along the info! Enjoy! Riding skill = the purposeful intention of using aids (hand, seat, voice, leg, weight) to communicate with the horse directly. We say “intention” because not all riders may actually be able to communicate their intention to the horse effectively, but the rider’s intention is there. For example, the aid for “walk on” could be leg aids (which is effective because the horse feels it) or making the sign for “walk on” (which is not effective because the horse won’t respond unless the leader supports the rider, however the rider’s intention is still there). Note a riding skill is not the aid itself, or riding through figures – it is the intent to communicate with the horse using some type of aid. Ex) Learn to ride a horse independently. Ex) Be able to sit on a bench independently. The skill you teach should directly relate to lesson’s objective (which helps the rider meet their goals). Ex) Rider will demonstrate halt to walk transitions 5 times during the lesson with no support. (Transitions help improve core strength, which will help the rider ride and sit on a bench independently). Practicing the skill in the practice and activity helps the rider meet the lesson’s objective. Ex) Plan to have the rider practice halt to walk transitions at 3 letters in each direction. Then do an activity of collecting the beanie babies around the arena which incorporates halt and walk on transitions. See Teaching The Skill 2.0: What, How, Why, Where for more on that! Do you remember your first lesson? What did you do? Which order would you teach these skills? (There is no right answer, this exercise is to show how it depends on the individual rider). Here is a handout for a list of potential skills you can teach your riders. I think it’s the best list I’ve come up with yet. Have your instructors in training practice how they will teach certain skills using this sheet. Work on it together. 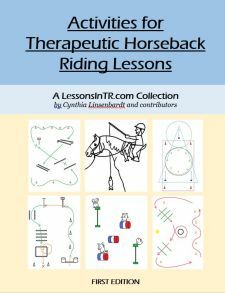 Sandy Webster‘s presentation about using riding skill to meet riders’ life goals, given at the Advanced Workshop I attended at Heartland Therapeutic Riding. The Registered Level On-Site Workshop and Certification I attended. 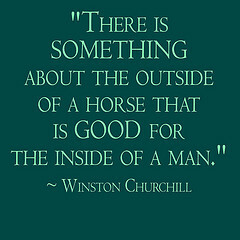 CHA Composite Horsemanship Manual which lists practically every skill there is.